This debut album, arrived at Christmas amid a pile of other new releases; but has been played every day since; often as a palette cleanser when I’ve had to suffer yet another whiney singer-songwriter with access to a Mac and Pro-Tools. If I have a gripe about HIGH TOP MOUNTAIN it is that it peaks with the opening track, Life Ain’t Fair (and the World is Mean); which is as good a Country song as anything Willie, Waylon or even Alan Jackson ever wrote in their prime and the delivery is worthy of that trio too. 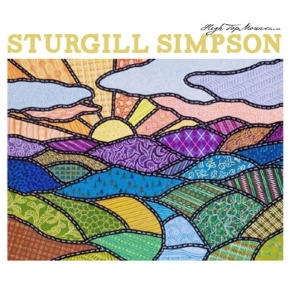 Simpson manages to squeeze every style of Country music into the 12 tracks, with Railroad of Sin and Poor Rambler, being 100mph Honkytonk gallops that leave you breathless and your toes suffering from tap fatigue; and on the slower love songs; like Hero, which is about his maternal Grandfather and Water in the Well the production manages to remain edgy enough to separate Simpson from the pap being churned out from Music Row and keep him firmly in the Alt-Country camp. In an album full of songs about ‘cheaters, heartbreakers and kicks in the balls,’ You Can Have The Crown has a lyric that stands out like a diamond in the dust; “I’m so poor I can’t even pay attention,” and proves what an articulate write the Kentuckian is. Like myself Sturgill Simpson is from coal mining stock; so his Old King Coal song resonated with me even before I’d heard it; and boy does he know how to deliver a lyric. Without over romanticising this brutal industry Simpson gets his weary message across like a punch to the gut. The album ends with a cover of a little known Willie Nelson song; I’d Have to be Crazy and is the embodiment of everything I’ve ever loved about Country music; with Simpson’s voice constantly on the verge of cracking up as he strums his Martin guitar while a pedal steel howls in the background. For far too many years now, Dale Watson has been the lone standard bearer for this style of ‘Classic Country;’ but with Sturgill Simpson we now have a new pretender to the throne.